This recipe is a first for me, it is the first time I was successful making candy. The last time I tried boiling sugar I burned it. I burned it badly. I actually had to throw away the pot because the sugar had scorched the bottom. This time around I did not leave the room, I did not quit stirring, and I actually used a thermometer which my eyes never left. As soon as the temperature reached 300 degrees F, I turned off the burner and removed the pot promptly.Â Heath Bars are one of my favorite candy bars, and I really wanted to succeed in making them at home. I may have actually danced with joy when I sampled these. Delicious chocolate and buttery toffee meet, and it is love. Have faith dear reader, you can make these yourself. You need to be patient and keep a watchful eye on the candy thermometer. Some people (more experienced than I) can do this without the trusty thermometer. If that is you congratulations. The sugar mixture will turn a lovely caramely brown when it is done. Or if you are like me and prone to burning sugar when you try to do it by “eyeing it” it is done when the thermometer reaches 300 degrees F.
These toffee bars should be added to your holiday treat platter. Make them for your family, make them for your friends, make them for your neighbors, and snitch some for yourself. Wrap them up in pretty paper and give them as gifts. 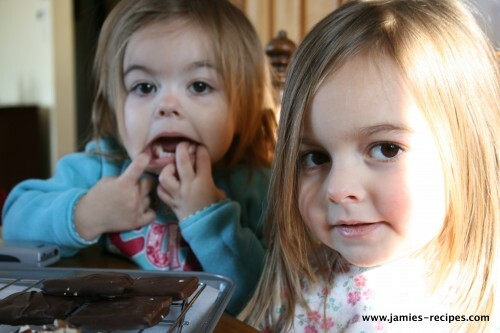 Becoming a food blogger has caused my children to want to pose with the food. They are some silly girls! Line a jelly roll pan with foil. Lightly grease the foil, and set aside. Melt butter, sugars, and water in a heavy sauce pan over a medium high heat. Using your candy thermometer monitor the sugar temperature. Stir constantly until it becomes a caramely brown color and the temperature reaches 300 degrees F, turn off burner and remove pan, stir in pecans (I forgot this step so I sprinkled them on top once they were covered in chocolate). Pour sugar mixture onto jelly roll pan and spread out. Wait a couple minutes as the sugar cools and the toffee begins to set. Using a pizza cutter slice toffee into desired size. Let cool completely. 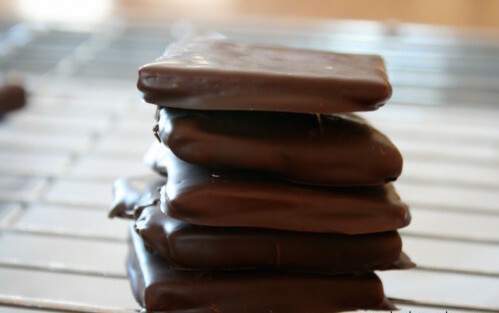 Once toffee is completely cooled and hard, gently break apart into individual pieces. Put chocolate into a double broiler and melt gently. 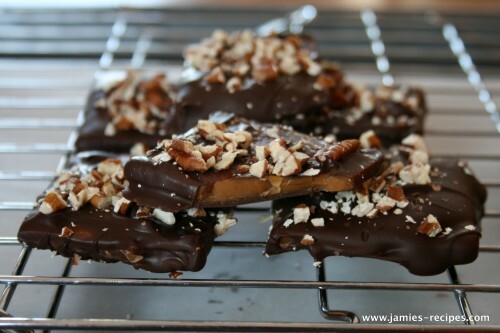 Drop one piece of toffee in at a time, cover completely with chocolate, shaking excess off, and place onto parchment paper to cool completely and have the chocolate set. If you want to sprinkle with chopped nuts do so before the chocolate cools. ENJOY! The crew saved me one bar and it was one of the most delicious things I’ve ever eaten. Top 5 for sure. I’ve been so unsuccessful with candy making that I am afraid to try, but yours were SO AMAZING that you may have inspired me to try again. I love the idea of layering them. It seems like it would be much easier and less time consuming. First off, i *LOVE* that last photo with your kids. Second, you have just given me another project that I must try!!! This looks FANTASTIC!!! thank you so much for sharing! This is my all time favorite candy…especially with nuts added! But everytime I make it my toffee is chewy and bendable! These look sooooo delish that maybe I will be brave enough to try once again. Maybe. Those look great! I (used to) love Heath bars, but now I find the toffee too sweet and almost unpleasant. I’ll defintely try this one soon–I already have a candy making weekend on the schedule. So gonna have to try that one out. Still waiting for my recipes to get up on your site! Hrmph. My ego needs massaging dangit! Tell you what, how bout you just wish my luck on my side project (http://plusonetocreativity.wordpress.com/) and pray that I can keep it up. I have done these twice and both times no go. first I burned them so the next time they didn’t set up, so I am going to try yours. Let you know how they turn out. Thank you. These sound and look so delicious, my mouth is watering. I am about to try the recipe. But I just had to write in first and tell you: Let those girls pose with the food any time they want. They are completely adorable! I’m going to try this but without nuts. I have dentures and love nuts but not with dentures. Or. I could put nuts into my chopper and grind them real fine and *layer* them.